The subtle tartness from the lemon combined with savory spices make this thick soup really delicious! It is easy to make, either using a crock pot or on the stove. 2-3 cups (packed) chopped kale center stems removed. See notes. Sauté onion in a dry skillet (or a large pot if not using a crock pot). As it begins to brown and stick, add 1 TBS water. Repeat process several times until onion is soft. Add garlic, cumin, coriander, curry powder and cook 1 minute. Deglaze pan with a little water to get all the flavorful toasted spices off. Transfer to crock pot, if using, or soup pot if cooking on the stove. Combine remaining ingredients (except kale, lemon juice, zest and salt/pepper) in soup pot or crock pot. Stir, cover and cook on low 6-7 hours or high for 4-5. See next step if cooking on the stove. If you aren't using a crock pot, cover the pot after adding the ingredients and bring to a boil, keeping a close eye on it. Once boiling, lower the heat to simmer and cook 40 minutes or so, until lentils and rice are tender and creamy, stirring occasionally. 10-15 minutes prior to serving, stir in lemon juice, zest and kale. Add water/broth to thin if necessary. Season with salt and pepper to taste. Enjoy with crusty bread and a salad. * It takes a little extra time and effort (not much) but it's SO worth it to toast and grind cumin and coriander using the whole seeds. Just toast in a dry pan on the stove a few minutes until fragrant. Then grind into a powder using either a mortar and pestle (I love mine) or a coffee grinder. The flavors are so much more intense and wonderful!! * Feel free to use spinach, chard, collards, etc. 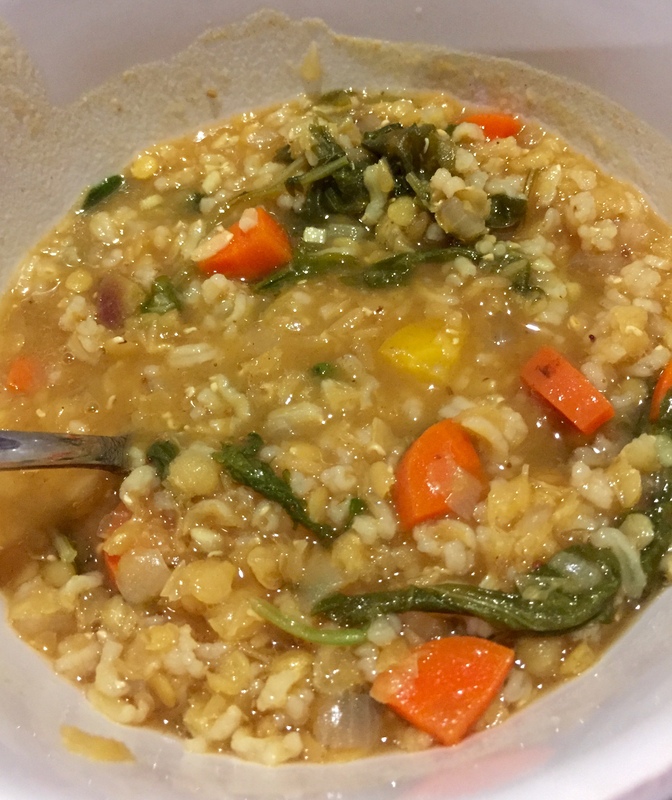 This entry was posted in Blog, Recipes and tagged basmati rice, clean, crock pot, gluten-free, kale, lemon, low-fat, no oil, oil-free, plant-based, red lentils, soup, vegan, whole-food by Shelly Detken. Bookmark the permalink.